PROVIDENCE, R.I. - Anti-Wall Street protesters around the U.S. who are vowing to stand their ground against the police and politicians are also digging in against a different kind of adversary: cold weather. Boston's Occupy movement, which has roughly 300 overnight participants and could face some of the most brutal weather of any city with a major encampment, has set up a winterization committee that will try to obtain super-insulated sleeping bags and other winter survival gear. Activists from the movement's flagship encampment, consisting of hundreds of people in New York City's Zuccotti Park, are sorting through packages arriving daily that include coats and jackets. In Providence, where city officials are threatening to go to court to evict hundreds of campers from a park across from City Hall, a core group said it will remain through the winter months  if not there, somewhere else. Rhode Island's capital has an average low temperature in the 20s from December through February and recorded nearly 3.5 feet of snow last year. Many of the more than 100 tents are not built to withstand harsh conditions. 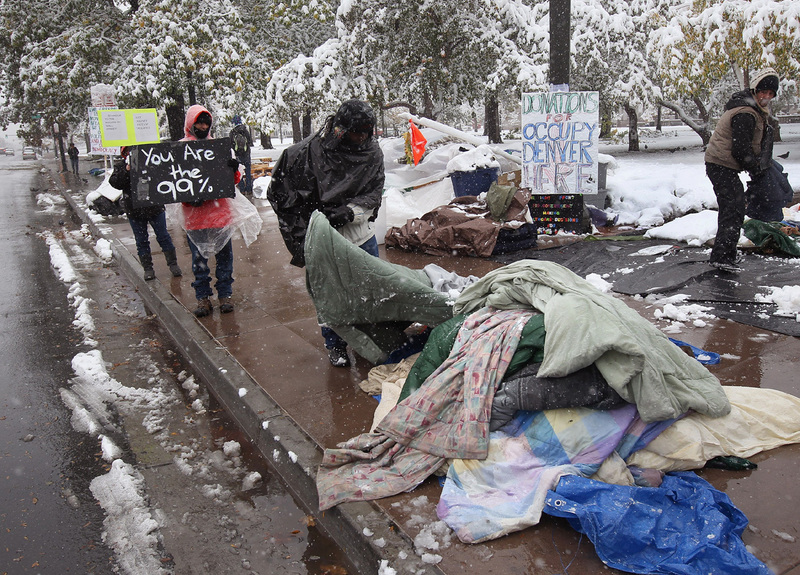 In Denver (left), as protesters prepared for this week's snow, a few dozen sympathizers stopped by to drop off blankets, gloves, chili and hot chocolate. Police refused to let activists erect a tent. That left some sleeping on the wet ground, covered by snowy tarps. Chris Goldstein of Riverside, New Jersey, owns one of the tents, though he sometimes sleeps at home. He learned the hard way during the first rainfall that the site has poor drainage: "I occupied a puddle." The self-employed writer and activist put pallets under the tent to lift it off the ground, and outfitted it with small carpets for insulation. In Chicago, where winters are famously bitter, protesters living in Grant Park are working to secure several indoor locations to get them through to spring. A church nearby is letting some demonstrators sleep overnight. Activists in Portland, Oregon, likewise said that moving the protest inside is the only realistic option.